The tent has been pitched outside of town and the performers are ready to thrill the crowd with their death-defying stunts. A new world of excitement awaits in Under the Big Top, the tenth expansion for award-winning tile-laying game Carcassonne. 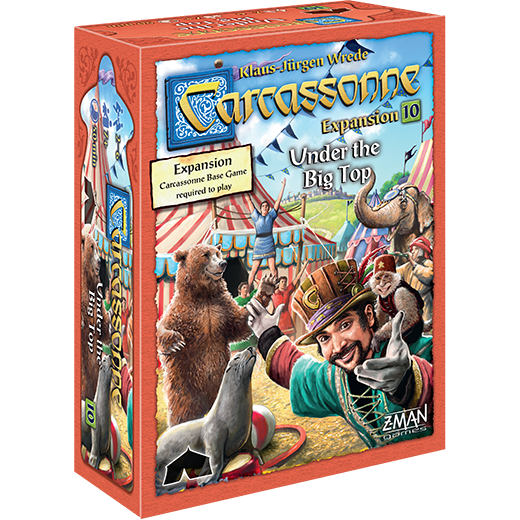 Capturing the thrill of the circus, this expansion incorporates twenty new Land tiles and two new follower types into the Carcassonne library. Players can use them to attract people from all over the countryside to view their menagerie of animals or witness their feats of death-defying skill. Just like the daring risks that circus performers take, Under the Big Top gives players plenty of opportunities to score big points�if they can draw in the crowds! At the circus, the big top is the main attraction. That�s no exception in Under the Big Top. Much of the expansion focuses on clustering groups of followers around the new tiles with the hope of getting big points when their features are scored. Gather meeples on the Circus tile and its accompanying big top figure or the eight tiles surrounding it and you�ll be rewarded the next time a Circus tile is drawn. Additionally, the circus is so exciting that normal followers are inspired to leave their lives behind and join the show. Stack your meeples into a meeple-pyramid on the Acrobat tiles, impress your friends, and score points once the show is over. Finally, ringmasters behave like normal followers until the circus shows up. When that happens, they score bonus points for being adjacent to Circus and Acrobat tiles when the features they�re on are scored. Under the Big Top brings a whole new layer of excitement to Carcassonne. Who will put on the best show and draw the biggest crowd?